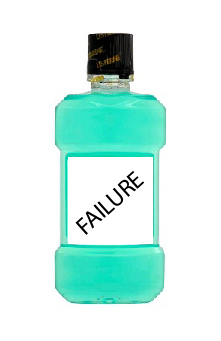 Failure should be like mouthwash, use it to kill the germs but be sure to spit it out. Failure can be a wonderful and powerful learning tool. The problem is that from the time we are born we are taught how to be successful. We are taught that the key to life is winning and that the way to be successful is to win, win, win. However, there are many great leader, people and organizations who have failed and yet have found success from what they learned. Their experiences taught them what to do and what not to do. This said, you should not plan to fail but be prepared to learn should failure present itself. Don’t get discouraged when failure enters your life. Sure, you will feel disappointed, frustrated, angry, sad, lonely, and at times hopeless. All of those are natural feelings as we are human. Allow those feelings to teach you. Take an assessment of what went wrong and what you can learn from that. Be willing to ask lots of questions and be honest with your responses. Once you have done this, be sure to take note of your responses so you are better prepared next time. Although failure can be a great teaching tool, don’t make it a habit. In fact, because there is such an emotional attachment to failing, it can have numerous negative impacts on one’s life. So learn what you need learn but be sure not to duplicate your mistakes. Just like with our teeth, we need to be sure we are brushing our teeth not just using mouthwash to kill the germs. So it is with our decisions, we need to practice those things that will lead us to success but when we fail, use it as learning tool but get back to doing what will lead you to success.